As I mentioned previously, I do like the finer things in life, and chocolate is no exception. Premium chocolate is some of my most coveted items, and I try to keep a stash of them. Especially GHIRARDELLI SQUARES®. Particularly, the Milk and Caramel kind. They're my fave! 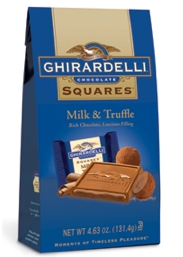 So when I got an email from SheSpeaks to take part in a Milk & Truffle GHIRARDELLI SQUARES® review, I said to myself, "Yum! A new flavor!" I usually get the limited editions around the holidays, especially since they're usually on sale! To have a GHIRARDELLI SQUARES® with a TRUFFLE INSIDE!? That's a beautiful thing! They were creamy and delicious! I may have found my new fave! Have you tried this latest edition to the GHIRARDELLI SQUARES® line? Thanks, SheSpeaks, for the opportunity to try these! Disclaimer: I was sent the product named above to review, as well as 2 $1/1 bag of Ghirardelli squares by SheSpeaks. The opinions expressed above are solely my own and yours may differ. Receiving a product will NEVER influence what I write in any review. LOVE LOVE their chocolates, these sound delicious! At Christmas time I went crazy over the dark chocolate and peppermint squares. I had never tried Ghirardelli before, but im now hooked since trying the milk and truffle ones! I can't wait to look for the seasonal flavored ones!